What was the most frequently referenced single event in the DC Silver Age of Comics? I'll give you a clue; although it was mentioned very frequently, the first time we learned of it, we did not see the event itself, we just heard about it. The shrinking of Kandor by Brainiac (the renegade scientist mentioned) is undeniably the most commonly referenced event. 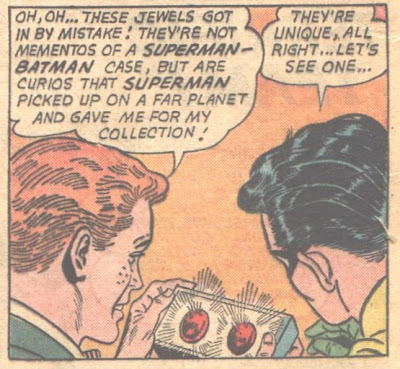 It comes up constantly in the DC Silver Age, because Kandor turned into a very popular topic for the Superman writers. Kandor had been the capital city of Krypton. 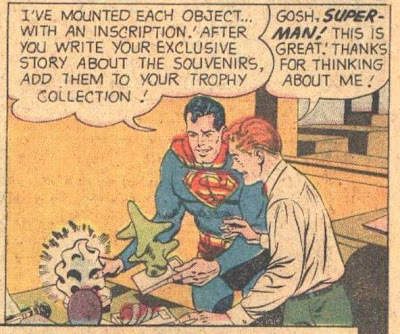 When Brainiac originally shrank it and put it into a jar, it was obviously seen as a horrific crime. But it turned out to be a blessing in disguise as Kandor was (apparently) the only city to survive the destruction of Krypton. Why did Kandor suddenly appear? It seems obvious from an editorial standpoint. Superman stories set on Krypton tended to sell, as did stories of other Supermen on Earth, and yet they were difficult to create given Mort Weissinger's simultaneous effort to establish continuity in the Silver Age Superman. Kandor succeeded in creating many memorable Krypton-type adventures for Superman. It had some success in bringing other Supermen to Earth, although this part represented a mixed blessing. The problem of Kandor is obvious. Superman had always been sold as the only survivor of an ancient race; now he was one of millions of survivors. It diminishes Supergirl's appearance the next year. And Superman's inability to expand the city (other than a convenient character or two at a time) was one of his few (but frequently mentioned) failures, like his inability to cure Mon-El of his reaction to lead poisoning. But overall the positives of the new locale for stories outweighed the negatives. In many ways, Kandor is another way of weakening the Silver Age Superman. It's a place where he no longer has his powers and must survive instead on his wits. 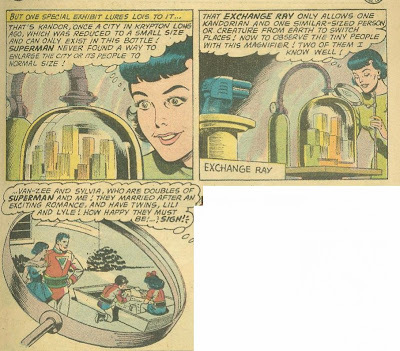 The Exchange Ray was a clever idea and although it was used fairly often it had one significant drawback; it required that one Kandorian come out of the bottle, which means effectively another Superman/Woman on Earth. As a result, other means were commonly used to get into and out of the bottle. In Superman Annual #5, we learned (from a brief text feature) that the leader of the Superman Emergency Squad is named Don-El. Another relative of Kal-El, perhaps? Whether they were helping out Superman and his friends or Weissinger and his writers, I can't say. 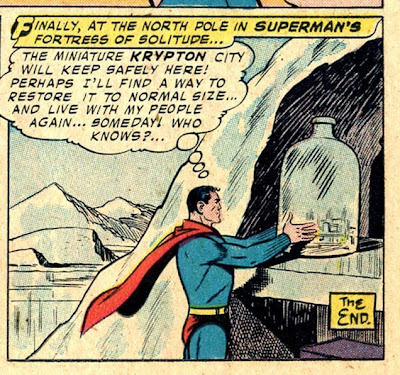 But the best Kandor stories were those that took place inside the bottle. As noted above, the idea of putting Superman on Krypton was irresistible to writers of the time, but it was becoming harder. 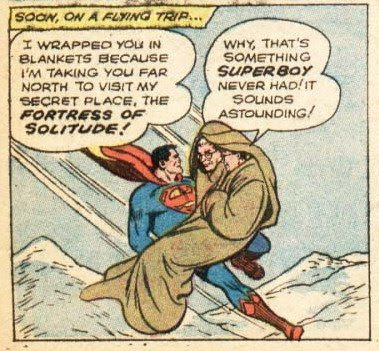 In the Golden Age, I think there's one story where Superman just flies back in time to Krypton. By the Silver Age that was verboten since we all knew that Supes would lose his powers under the higher gravity and red sun of his home planet. So it became a challenge to the writers; how do you put Superman on Krypton without having him somehow then rescue his parents before the planet's explosion (or die himself)? Answer: Put a little bit of Krypton on Earth. This hits on a theme I've talked about before; one of the big changes that Weissinger made was to make Superman more vulnerable, because he realized a legitimately invulnerable character made the series rather dull and forced the more comical approach which he clearly did not favor. Kandor was a place where Supes placed his life on the line. I'll be adding to this post over time, as Kandor is a very involved and interesting topic. 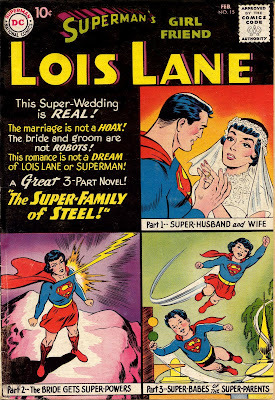 It is easy to focus on Lois' negative qualities in the Silver Age--the jealousy, the outrageous temper tantrums, and the willingness to toss Superman aside as soon as some other man held some fascination. 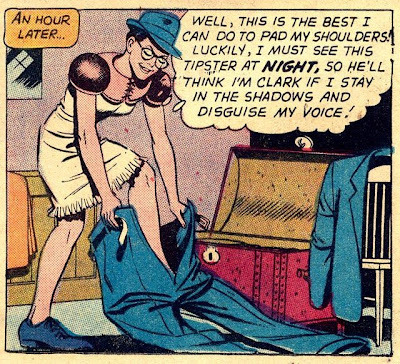 Those qualities are part of what makes Lois such an entertaining character in the Silver Age. Of course the key here is recognizing that the QWERT YUIOP message is just the top line on a typewriter, which any reporter would recognize. 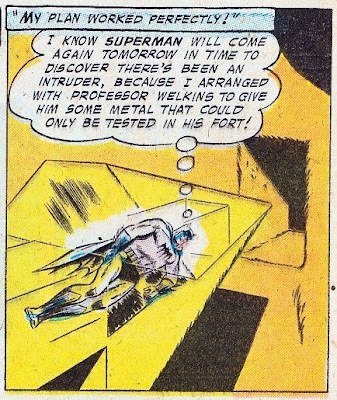 Of course, Kandor had a huge role to play in the Silver Age Superman. 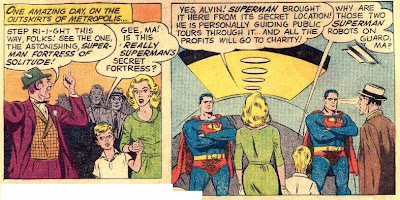 In a way, this seems to be the real purpose of the Fortress; not so much for Superman to get away from the pressures of the outside world, but a place for him to entertain visitors and guests. 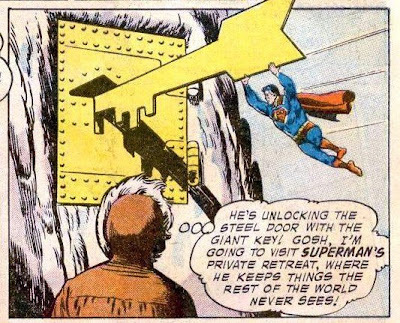 This month is a celebration of the Silver Age Superman, but I cannot let it pass without noting one of the really oddball aspects of this era, and that is how many times Superman created needless problems for himself and others. For example, consider his casual attitude about giving alien jewels and flowers to people which (inevitably) caused very negative things to happen. 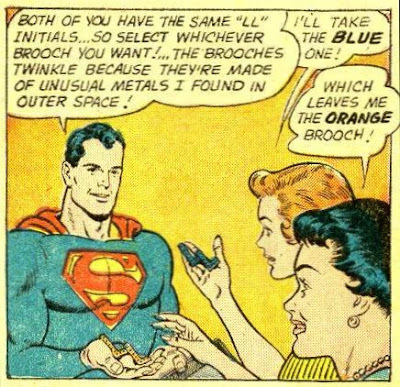 You've got to wonder if Supes at some point might say, "You know, alien things tend to cause strange reactions among my friends, so maybe I'll just buy them a golden brooch at Zales instead of something unpredictable from the planet Zebulon." Of course some of this is our old friend, the puzzle cover. In the DC Silver Age Superman, the puzzle cover absolutely reached its zenith, and there was undoubtedly pressure from Weissinger to the writers to come up with amazing situations on the cover. Hence all these space jewels/metals/fruits that cause nutty effects on the recipients. 1. Jonathan and Martha Kent. Superman's adoptive parents had been around since the late 1940s, appearing in the Superboy stories only. The Kents were initially farmers, but in the Superboy series at the time they were now proprietors of a general store (a smaller forerunner of today's supermarket). They had passed away shortly before Clark moved to Metropolis to pursue his career. 2. Krypto. Krypto had been baby Kal-El's pet on Krypton, who made it to Earth in a test rocket of Jor-El's. His first appearance was in Adventure #210 (July 1955). 3. Streaky, the Supercat. Streaky was a earthly pet of Supergirl's who gained superpowers when exposed to X-Kryptonite, a product of an experiment by Supergirl in an attempt to cure her weakness to Green Kryptonite. 4. Comet, the Superhorse. 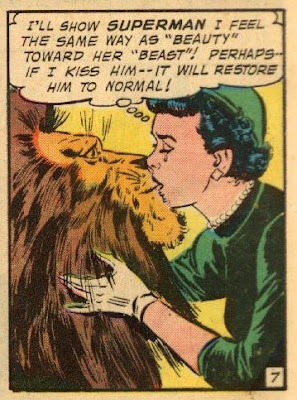 Comet was originally a centaur who first appeared in Action #292 (October 1962). Circe, a female magician, attempted to turn him into a man, but the spell backfired and he became a horse. As compensation, Circe gave him superpowers. When an actual comet entered the solar system, he would be briefly transformed into a human being, in which form he became one of Supergirl's many boyfriends. 5. Mr Mxyzptlk. Pronounced Mix-yez-pit-el-ik. He was a fifth dimensional imp and prankster. Although very annoying, he was not a villain per se, being more of a pest. He could be forced to return to his own dimension for three months by being tricked into saying his name backwards. He had many appearances in the Golden Age as Mr Mxyztplk, but he had been defunct for several years before returning in Superman #131 (August 1959). 6. The Legion of Superheroes. A team of crime-fighters and do-gooders from the 30th Century who first appeared in Adventure #247 (April 1958). The characters pictured here are Sun Boy, Cosmic Boy, Lightning Lad, Saturn Girl and Chameleon Boy. 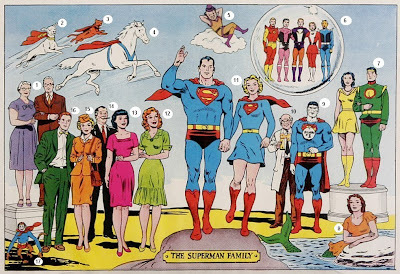 The group included many other members, with Superboy and Supergirl each joining during the Silver Age. 7. Jor-El and Lara. Superman's parents from Krypton. Although dead for many years, they made frequent appearances in the Silver Age through time travel, imaginary stories and devices that could capture the past. Jor-El, in particular, became a very significant character during this era. 8. Lori Lemaris. Lori is "The Girl in Superman's Past", Clark Kent's college sweetheart in a wheelchair, who turned out to be a mermaid from Atlantis. 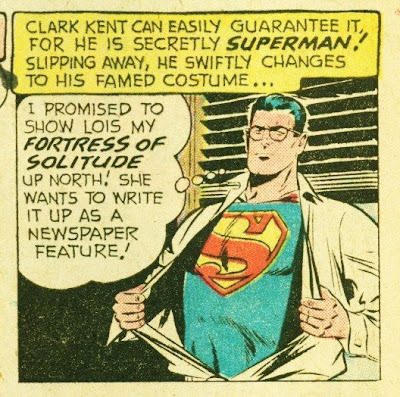 First appearing in Superman #129, (May 1959), Lori refused a marriage proposal from Clark, but they remained good friends, and she was one of the few people on Earth to know his secret identity. 9. Bizarro #1. Bizarro was a poor copy of Superman created by a ray machine, who did everything wrong. 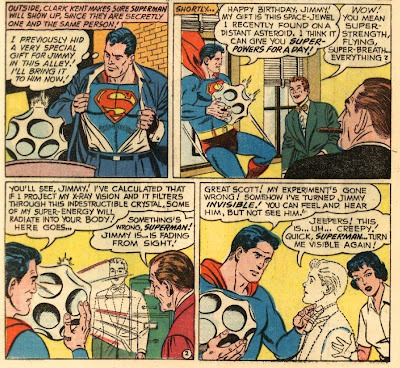 The first Bizarro perished at the end of Superboy #68 (October 1958). 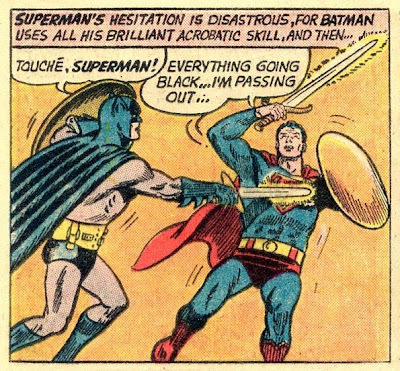 A later version was created by Luthor in Action #254 (July 1959). By this time, Bizarro lived on his own square world called Htrae. Bizarro #1 was the original Bizarro, but there were many others by this time, hence the little medallion designating him as the original copy. 10. Professor Potter. The professor was the catalyst for many silly Jimmy Olsen and Lois Lane stories. He was forever inventing gadgets which would kick-start the story, and initially appeared in Superman's Pal, Jimmy Olsen #22 (August 1957). 11. Superman and Supergirl. The stars of the show. Superman first appeared in Action Comics #1 (June 1938), while Supergirl showed up in Action #252 (May 1959). 12. Lana Lang. 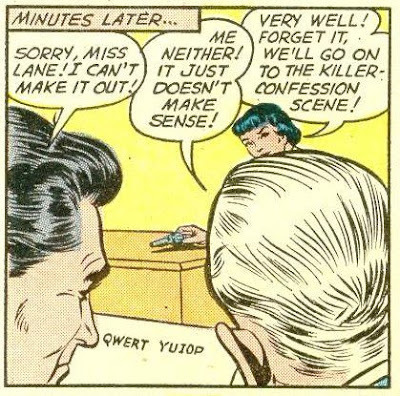 Clark Kent's neighbor in childhood, Lana was a frequent pest for Superboy, forever suspicious of his secret identity. 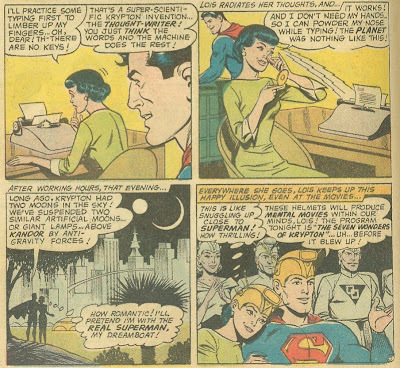 Although she had been a longtime character in Superboy as a teen, she made her first appearance as an adult in Showcase #9, in yet another story entitled, "The Girl in Superman's Past." 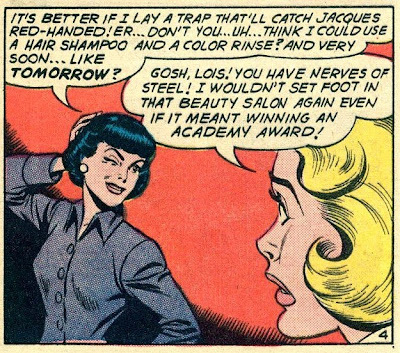 Lois and Lana were (usually) friendly rivals for Superman's affections. Lana worked as a TV reporter in Metropolis. (Kudos to commenter Paul Saether for the correction on Lana's first appearance). 13. Lois Lane. Superman's main girlfriend in the Silver Age, she was also Clark Kent's competitor at the Daily Planet. She had been around since Action Comics #1, marking her as tied for the longest-running character in the DC universe, with her boyfriend. Lois had a few tryout appearances in Showcase during 1957 and was awarded her own book in March 1958. 14. Perry White. The editor of the Daily Planet, Perry was the boss of Clark, Lois and Jimmy Olsen. Usually portrayed as hot-headed, Perry also had a heart of gold. Perry had been around since the Golden Age, although he actually debuted on the Superman radio series. 15. Lucy Lane. 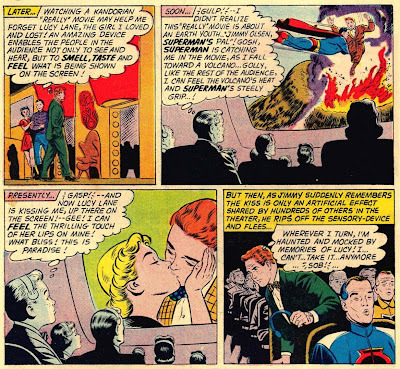 Lois' younger sister was Jimmy Olsen's more-or-less steady girlfriend, although neither of them hesitated to date others on the side. Lucy first appeared as an airline stewardess (they weren't called flight attendants back then) in Superman's Pal, Jimmy Olsen #37 (April 1959). 16. Jimmy Olsen. 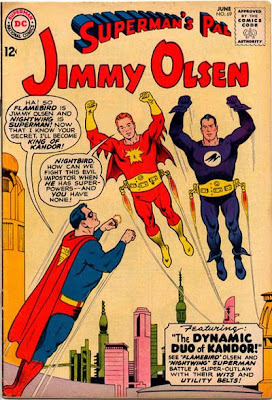 Like Perry White, Jimmy Olsen had debuted on the radio show and then moved over to the comics. He had been a very minor character in the comics before getting his own book in September-October 1954, and the prominence of the character in the radio and TV series were probably the cause of him receiving his own book before Lois Lane. 17. Beppo, the Supermonkey. The final member of the supermenagerie, Beppo was a Kryptonian monkey who had stowed away in the rocket in which Jor-El sent Kal-El to Earth. First appearing in Superboy #76 (October 1959), he was an infrequent character in the DC Universe. Bottle City of Kandor. 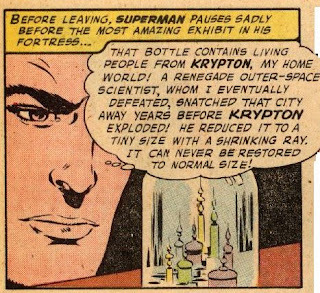 Kandor was the capital of Krypton before it was shrunk and placed in a bottle by Brainiac. 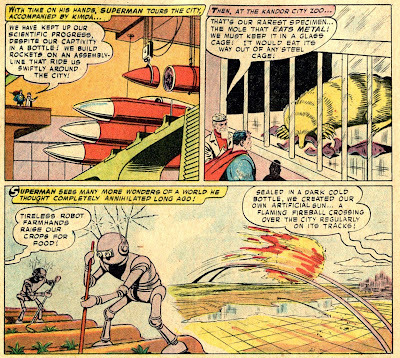 Kandor became a frequent setting for Superman stories after he rescued it in Action #242 (July 1958). I have a long post on Kandor coming up. Lex Luthor. Luthor was one of Superman's oldest foes from the Golden Age, and the only villain who appeared more or less continously from the 1940s onward. One of the real treats of the Silver Age Superman was the evolution of Luthor's character from that of a standard mad scientist into a complex character. I discussed Luthor's changes in the Silver Age here. Phantom Zone criminals. 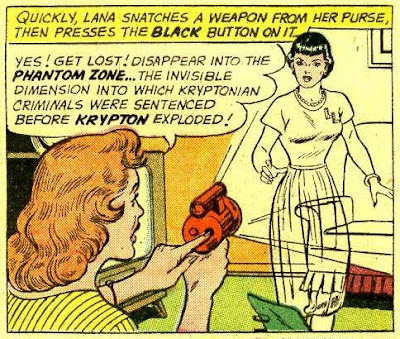 The Phantom Zone was first mentioned in Adventure #283 (April 1961). It was a "twilight dimension" where Kryptonians who had violated the law were sentenced. While there they had no physical presence or any ability to interact with the real world other than to talk to people who were telepathic. Ironically, being in the Phantom Zone turned out to be a blessing for the criminals, since they survived the end of their planet. Periodically one of them would escape, causing havoc for Superman. Also, Superboy used the Phantom Zone to save Mon-El, who was dying of lead poisoning at the time. Fred and Edna Danvers. The Danvers adopted Linda Lee (Supergirl) a few years after her arrival on Earth and learned her real identity. Zor-El and Alura. Supergirl's natural parents, they were thought to have perished with Argo City, but they beamed themselves into the Survival Zone, an alternate Phantom Zone. Eventually Supergirl rescued them, and they lived in Kandor.